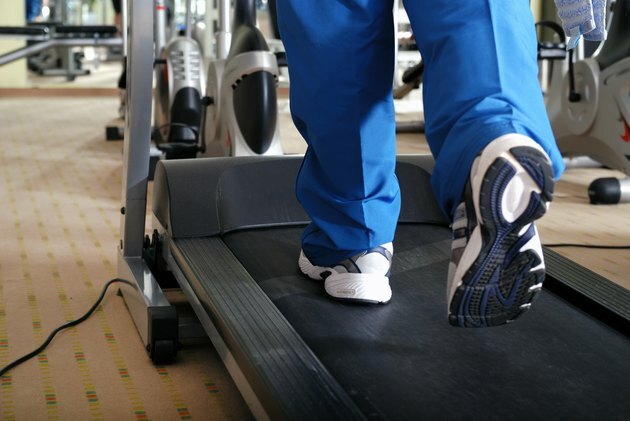 If your treadmill doesn't start, you will need to troubleshoot the possible cause. Depending on the make, model, age and condition of your machine, the problem might be something you can repair yourself. Start with the simplest possibilities, such as the power source, then move to the more complex possibilities, such as the motor controller. Treadmills have specific power requirements that the manufacturer specifies in the owner's manual. Most manufacturers recommend plugging your treadmill into a single-outlet surge suppressor with certain voltage suppressor ratings. Plug the surge suppressor into a grounded outlet on a dedicated, 120-volt circuit. Most treadmills are not compatible with a GFCI outlet. If your treadmill is not properly plugged in, power surges and fluctuations in your house can damage your machine, causing it to not run. If your treadmill won't start, make sure the safety key is fully inserted in the console. To protect the user from injury, a treadmill won't run if the safety key isn't in the console. Treadmills have a circuit breaker that trips if there is a surge of power. This protects the electronic parts from damage. The switch is typically on the front of the treadmill near the power cord. If the switch protrudes, it has been activated. Wait five minutes, then press the button back in. Loose or broken parts under the motor hood of your treadmill can cause the machine to not start. If the console lights up, but the treadmill won't start, the motor controller could be damaged. Loose wires under the motor hood or in the console can cause your treadmill not to start. Remove the screws and lift off the motor hood. Look around for any obvious damage, burns, loose or broken wires. Contact the manufacturer of your treadmill if you cannot find the source of the problem. If your treadmill is still under warranty, the manufacturer may cover the cost to repair your machine, depending on the fine print in your contract. If you attempt to fix the treadmill yourself and it is under warranty, you may void the warranty. In this case, only perform the troubleshooting tips listed in your owner's manual or recommended by your manufacturer.